Softens, smoothes and brightens skin, while evening tone and reducing dark spots. Greetings from NW Arkansas, where if you don’t like the weather, wait five minutes and it will change. I am a 50+ year-old woman who has combination skin that is particularly sensitive to harsh chemicals and fragrances in many skin care products. I don’t think my skin would be labelled as sensitive otherwise, but it certainly can make a fuss over certain ingredients. I routinely use an over-the-counter 2% retinol every other night with no ill effects and rely on the use of BHAs, exfoliating cleansers, peels and a special “microfiber cleaning cloth” to exfoliate my skin due to my unusual sensitivity to alternating AHAs and retinol in my routine. Despite not being able to use AHAs, I still thought I was doing a pretty good job exfoliating. But that was before TIA asked me if I would consider trying a new, highly-touted professional microdermabrasion home appliance, the Trophy Skin MicrodermMD ($299 in the shop). Now, I have never set foot inside a dermatologist’s office, so treatments like microdermabrasion were just skin care options I had read about and doubted I would ever actually do. 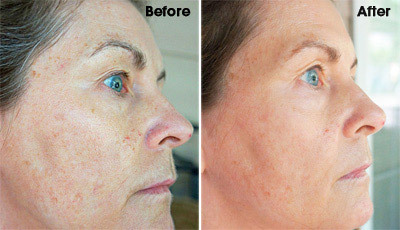 My mistake was thinking microdermabrasion was only for people who suffered from acne scarring. Trophy Skin’s claims are: “MicrodermMD is a new development in portable home microdermabrasion machines designed to correct a multitude of skin imperfections. 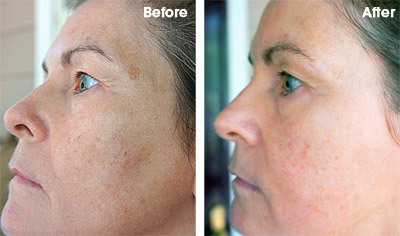 Using the very same technology as professional equipment found in spas and salons, the MicrodermMD uses finely compressed diamond peeling tips combined with a medical-grade vacuum mechanism to gently and safely exfoliate and remove dead skin particles and dirt from the treatment area quickly and professionally, while reducing the risk of inhalation. In addition to exfoliating, the MicrodermMD can push skin care products further beneath the skin and remove blackheads with the included infusion and extraction tips. A 5-10 minute treatment a few times per week is all that is needed to achieve smooth, glowing, radiant skin!” (quoted from their website). I have to say, that’s a pretty lofty set of claims for one beauty appliance to provide. My MicrodermMD arrived packaged securely and in perfect shape. The entire machine and its working parts are encased in a white clamshell-shaped container that fits nicely in your lap or on a small table (approximately 11″x8″). Yes, it’s attractive and looks great on my vanity without taking up too much space. 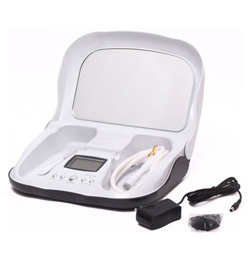 I went online to look at some professional spa microderm machines, and this looks and seems to function like the “real deal”, only smaller. It is listed as a professional grade machine. Of particular note is the machine’s ability to run on “auto or manual” mode. You can adjust the suction as needed on the manual. On auto, it provides the correct amount of suction for each area of skin. Inside the device, you will find everything you need, easily stored in this thoughtfully designed clamshell case. Upon opening the clamshell lid, I was delighted to note that it contains its own mirror in the top lid with a 5x magnification. In the body of the MicrodermMD is approximately 42 inches of flexible tubing upon which mounts the exfoliation wand and a removable standard, genuine diamond tip of medium coarseness. Also included is an extraction tip for blackhead removal. I did not use this as I do not have a problem with blackheads. You also receive a bonus infusion tip to help with serum penetration, though I didn’t notice much difference with that. And that is not all! You will receive a plastic bag of a hundred count wool filters, a diamond tip cleaning brush and four replacement O-rings for the wand. Enough essential supplies to keep you going for quite a while. Another bonus is the “international” power adapter and an almost unheard of a 3-year warranty. I give it an A for aesthetics and design, with my only concern being occasional kinking of the tubing, thus cutting off the suction. I might add that after I noted this was happening, it was easily remedied by holding it at a different angle. Also available for separate purchase are a variety of tips for special uses, and you can replace the diamond tip when it no longer functions well. Two extra tips I would find helpful would be the precision diamond tip for small areas like your nose and around your eyes, and the large diamond tip for your larger body parts and pieces. I believe they claim the life of your diamond tip to be approximately 6 months with normal use. Now what you have all been waiting for in this review. How did I like it? Was it easy to use? What were my results? Well, I am about to either titillate or bore you. Grab a tall glass of H2O and read on for my experience and results with the Trophy Skin MicrodermMD. I began by watching the included instructional video which gives you the basics. However, I learned more about using it by watching YouTube videos by “expertvillage” and many others. All in all, the provided video is helpful but rather basic. So, if you are unsure of how to use it in a certain area or have another question, check it out on YouTube. I certainly felt less apprehensive after doing a little online research. The first step is to make sure you have a clean, oil-free canvas with which to work. So, wash your face, and other areas you will treat, with a gentle foaming cleanser and pat dry. I found that I used the device on the auto mode most of the time. It’s so easy. The LCD on-screen directions illustrate arrows pointing to the area to treat, the direction to move the diamond tip and the length of time for each area—it is all programmed in (at least on auto mode). I used the manual mode for spot treatments in particular areas of concern such as my hands, chest and stubborn sun-damaged areas. I am a bit slow with the wand, so going through the entire auto mode on each side of my face/neck/chest worked best for me. That is to say, I exfoliated the right side, then started over and exfoliated the left side. It does not actually hurt, but rather feels like finer grit sandpaper rubbing across my skin. It seems to be best not to run the diamond tip wand over the same patch of skin more than twice, lest you should cause too much irritation. An important step in your treatment is to always ensure there is a clean wool filter on the wand and then replace the diamond tip. This will ensure your machine has a long life. I first began this with a bit of trepidation. My first try was a bit frustrating and just a little frightening, as I kept getting the tip stuck to my face due to the suction. I quickly learned how to brace the skin I was working on with my other hand, making short, even strokes with the diamond tip wand. If you lose suction, either the tip is not flat against the skin, or you might check your tubing for a kink. You definitely should not use excessive pressure of the diamond tip while passing it across the skin. You should only feel a mild scratching feeling. By my third treatment, I had the proper technique down and it just kept getting easier with each use. I began with one treatment a week from forehead to chest and tolerated that very well. I am now exfoliating my face and neck two to three times a week, and work on my chest, hands and other particularly stubborn areas during the week. I honestly enjoy the experience. It is so easy to spend five or ten minutes giving yourself beneficial skin treatment while you are watching a movie. I do not find that I procrastinate in using the MicrodermMD, like other beauty appliances I have owned. I guess it is the instant gratification I see from each use. Because I know there are going to be people who ask and because I think it is an important part of my review, I am going to list who should NOT use microdermabrasion due to certain skin conditions or diseases that would be affected negatively. Those who are NOT good candidates for microdermabrasion are those with deep scars, active keloids, undiagnosed lesions, a recent herpes outbreak, warts on the face, skin cancer, active acne, sunburns or active rosacea, eczema, or an auto-immune system disorder. (source) Pregnant women should not undergo microdermabrasion, though I didn’t find out the particular reason for this. I would recommend you ask your doctor and follow his or her advice. Individuals with deep scars, facial creases, or other moderate-to-severe skin issues will probably need to consult their dermatologist regarding a stronger type of treatments such as laser resurfacing. OK, now for my results. I honestly think that this machine is beneficial for women of all ages who want their skin to look its best at all times. With microdermabrasion being between $150 and $200 a visit, the MicrodermMD is worth its weight in gold for a mere $300 investment. I think the replacement tips are reasonable at $50 for the diamond tips, replacing them approximately every 6 months. I will add that although you will see an almost immediate positive effect, it is no panacea for the deeper wrinkles, larger long-standing dark spots, nor very saggy skin. With that being said, even after my first treatment, I did notice my skin was very soft and smooth. I also noted my skin color was a bit more even, the smaller dark spots weren’t as dark and some of my crepey neck skin looked smoother. With further use, my skin has taken on a more even tone, many of my previously large pores are greatly minimized, and the skin just looks brighter. My fine wrinkles look quite a bit less noticeable than they did before MicrodermMD and to my surprise, my neck skin looks a bit tauter. If I hadn’t noticed it myself, I wouldn’t have believed the MicrodermMD could help the appearance of my 50-something neck, though it is one of their claims.. However, I am very critical of my own skin and I did notice improvement of my neck’s tone and texture. Since that is the problem I am currently fighting, I am thrilled. I am sure this is partially due to the exfoliation exposing newer skin, instead of the old, dry, flaky skin that makes it look “crepey”.Another plus from this machine is that my skin care products are going further than before I began microdermabrasion. I have high hopes that, with continued use, my “neck rings” and the sagging that is beginning will be further reduced, though doubtfully eliminated at my age. I have also used it on my chest, hands and upper arms with similar results. I really cannot think of anything negative to say about Trophy Skin’s MicrodermMD. As long as you do not have unreasonable expectations, I think you will see positive results such as I have described above. I plan to have a long and lasting relationship with my MicrodermMD, especially with that great 3-year warranty. My thanks to Marta, the TIA community and Trophy Skin for allowing me to try this wonderful addition to my skin care routine. Try it, I think you’ll like it!